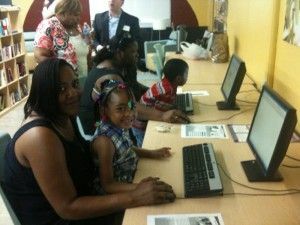 Detroit Public Schools announced today that parents and students can soon access a variety of education resources, including online textbooks and class assignments, from anywhere with an Internet connection, thanks to a brand new robust online parent portal called the DPS Learning Village. And by January, parents, teachers, and counselors in all schools will have access to unparalleled and immediate electronic communication about students’ progress tied to students’ grades, absences, and more. The system is connected to an online, password-protected Electronic Grade Book. Through the Parent/Student Learning Village tool, parents and students will receive a username and password and can pull a variety of educational resources for all grade levels, including class assignments, class syllabus, online textbooks, event calendars, activities, and education programs like Destination Reading and Math. Related links to other helpful resources also are available on the homepage, such as the Michigan Department of Education and Discovery Education, a website with digital educational materials. The Parent/Student Learning Village and the Electronic Grade Book are part of a district-wide strategy to accelerate DPS’ transformation into a 21st-century learning environment by enabling parents to continue students’ education at home, after school hours and on weekends. Phase One of Learning Village, which kicked off in early 2010 as part of Houghton Mifflin Harcourt’s multi-year technology partnership with DPS, provided teachers with an abundance of online educational resources and classroom instructional tools such as Destination Reading and Math, as well as Data Director – a program that allows teachers to utilize test data to drive instruction in the classroom. So far, more than 4,000 teachers have successfully accessed the program, many of which use it daily. Phase Two of Learning Village, which launched this week, allows parents and students to log onto Learning Village from any computer with Internet access by going to the DPS website, detroitK12.org. Parents will have immediate access to online textbooks, event calendars and education programs like Destination Reading and Math as well as other helpful resources. Material specific to a child’s class such as homework assignments and class syllabus will be populated by DPS teachers starting in the fall. All DPS academic coaches will be offered free training sessions this summer on Learning Village so they can teach their respective DPS teachers how to upload lesson plans and assignments for students in the fall, as well as utilize the educational resources to complement instruction. Eight Parent Resource Centers are actively participating in helping parents use Learning Village, including providing training workshops. Additionally, staff has been trained and can assist parents both in person and by phone. This initiative is in close coordination with Parent Engagement 2.0, a DPS plan to increase parent involvement through the school-based Parent Resource Centers, training camps that focus on parenting, workshops and more. In addition, Learning Village can be accessed online through the Detroit Public Library, branches of the City of Detroit Parks & Recreation, Detroit YMCA locations, area churches, community development centers and Focus Hope. Learning Village is part of Houghton Mifflin Harcourt’s partnership with DPS to provide a unique, integrated education solution that combines advanced technology, customized lesson plans, and professional development designed to increase student learning. Online education tools include Destination Reading and Math, two online learning programs in which Houghton Mifflin Harcourt will soon launch a “Virtual Summer Camp” version to supplement in-person summer school learning. Parent workshops for the new Learning Village portal will be held June 13 at all Parent Resource Centers. Electronic Grade Book – This Electronic Grade Book allows parents to view the grades their child has earned on classroom assignments. This Grade Book is tied to the marks-gathering process. Data-driven notification and tracking system – This tool can be established to notify school officials and parents when certain pre-determined triggers are engaged. For example, a notification can be established to be automatically sent to teachers, counselors and parents whenever a student amasses 3 consecutive absences. The expectation is that a plan of action and interventions for the student are immediately implemented. PULSE (Early monitoring system for students who are heading off-track) – This system gives school officials information, based on a rubric, about students that are heading off track for promotion or graduation. Intervention is expected immediately upon notification. Parent Connection – This tool, which is tied to the Grade Book, allows parents, schools and teachers to connect around individual student progress. The system will display data on attendance, grades, classroom assignments, and more. Parents and teachers will be able to exchange emails via this tool. Bates, Denby, Chrysler and Burton International are currently participating in a pilot of the Parent Connection, Grade Book and other new tools. The anticipated roll out to the entire district is in January 2012. Both DPS Learning Village and the online Grade Book align with the Family/Community Support and Empowerment section of DPS’ academic plan, focused on creating widespread, effective two-way communication using a variety of tools to engage families and the community. Under the district’s five-year academic plan, students are seeing a more rigorous academic curriculum at every school. The academic plan includes extended time for reading and mathematics under a common core curriculum; pre-algebra for 7th graders; tutors for pre-kindergartners through the Volunteer Reading Corps; additional language courses; more Advanced Placement courses; and more opportunities for student apprenticeships, internships, shadowing and mentorships. Houghton Mifflin Harcourt is a global education and learning company that is leading the way with innovative solutions and approaches to the challenges facing education today. The world’s largest provider of educational products and solutions for pre-K–12 learning, Houghton Mifflin Harcourt develops and delivers interactive, results-driven learning solutions that advance teacher effectiveness and student achievement. Through curricula excellence and technology innovation, Houghton Mifflin Harcourt collaborates with school districts, administrators, teachers, parents and students. Today, HMH education products and services are used by 57 million students throughout all 50 U.S. states and 120 countries. With origins dating back to 1832, the Company also publishes an extensive line of reference works and award-winning literature for adults and young readers. For more information, visit www.hmhpub.com. This entry was posted in Info News Center, News and Press Releases and tagged Academics, Emergency Manager.